The Airbus A340 is a long-range four-engined wide-body commercial passenger airliner manufactured by Airbus, a subsidiary of EADS. It seats between 261 and 380 passengers, and has a range between 6,700 and 9,000 NM (12400 to 16600 km). It is similar in design to the twin-engined A330. Initial A340 versions share the fuselage and wing of the A330 while later models are longer and have larger wings. The first published studies for the A340 were as the TA11 in 1981, as shown in the November issue of Air International Magazine (coinciding with the display of the A300 at that year's Farnborough Airshow). Concept drawings of the A320 (SA 9) and A330 (TA9) were also published, along with estimated performance figures by Airbus Industrie. The A340 was launched in June 1987 as a long-range complement to the short-range A320 and the medium-range A300. At the time, Airbus's twinjets were at a disadvantage against aircraft such as the Boeing 747 because of the ETOPS problem as defined by the regulations: two-engined aircraft had to stay within 60 minutes' flying distance of a suitable diversion airport, which prevented them from competing on long over water routes. Furthermore, the existing ETOPS-immune wide-bodies in the 250-300 seat range, the trijet DC-10 and L-1011, were aging, as they had been in service since the early 1970s. The A340 was designed in parallel with the twin-engined A330: both aircraft share the same wing and similar fuselage structure, and borrow heavily from the advanced avionics and composite structure technology developed for the A320. Both the A330 and A340 are assembled on the same final assembly line at Toulouse-Blagnac, France. 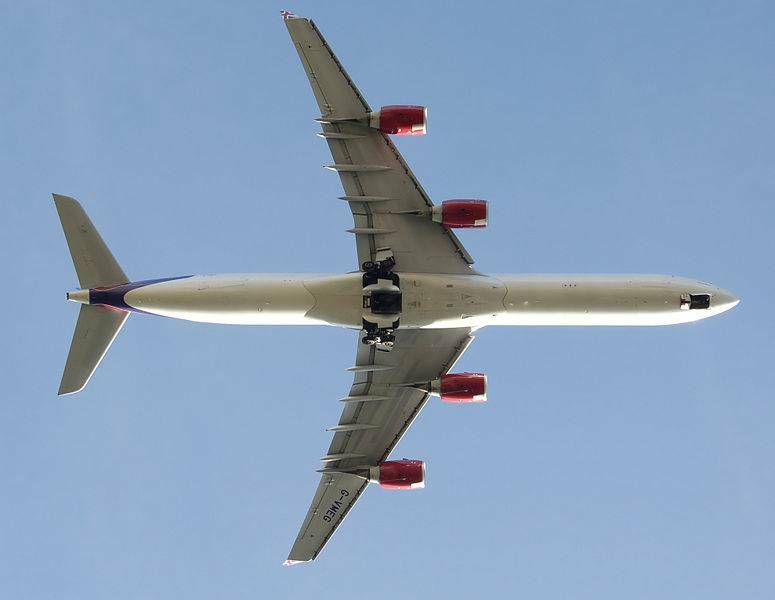 The four-engined A340 is able to fly long over-water routes. Because of its ETOPS immunity, Virgin Atlantic Airways used the motto "4 Engines 4 Long Haul" on its A340 fleet. The A340 was intended to use the new superfan engines of International Aero Engines, but the engine's development was stopped. The engine nacelles of the superfan engine consisted of provisions to allow a large fan near the rear of the engine. As a result of the superfan cancellation by IAE, the CFM International CFM56-5C4 was used as the sole engine choice instead of being an alternate choice as originally envisioned. 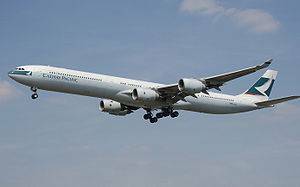 The longer-range versions, the A340-500 and -600, are powered by Rolls-Royce Trent 500 engines. When the A340 first flew in 1991, engineers noticed that the wings were not strong enough to carry the outboard engines at cruising speed without warping and fluttering. To alleviate this, an underwing bulge called a plastron was developed to correct airflow problems around the engine pylons and to add stiffness. The modified A340 began commercial service in 1993 with Lufthansa and Air France. The A340 incorporates features such as fully digital fly-by-wire flight control system. It also uses joysticks instead of yokes, with one joystick to the left of the pilot and one to the right of the co-pilot. The A340's flight deck is highly similar to the A320s, and employs a common pilot rating with the A330. This enables A330/A340 flight crews to fly A320s and vice-versa with minimal extra training. This saves costs for airlines that operate both aircraft families. The cockpit used to feature CRT based glass cockpit displays on the A340-200 and A340-300 and is now based on LCD displays. Some composite primary structures are also used. 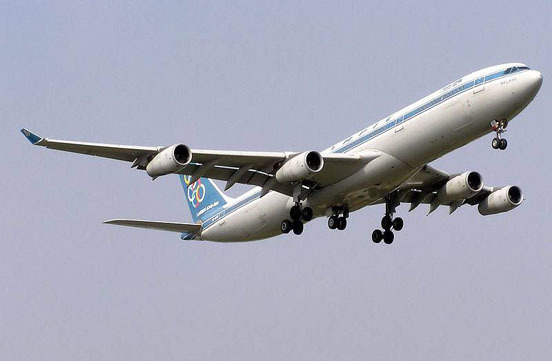 An A340 was the first commercial jet on which pasengers could use their mobile phone during flight. In March 2008 Emirates Airlines introduced a system allowing passengers to make outgoing calls with their handset. Incoming calls are not possible and the system is not available at night or during landing and take-off. With the introduction of higher gross weight Boeing 777s such as the 777-200ER and specifically 777-300ER, sales of the A340 began to decline. Over the last few years the 777 has outsold the A340 by a wide margin. Although the larger GE90 engines on the 777-300ER burn considerably more fuel than the Trent 500s, using only two of them compared to four Trents has meant a typical operating cost advantage of around 8-9%. A340-600 at the Farnborough Airshow, 2006. 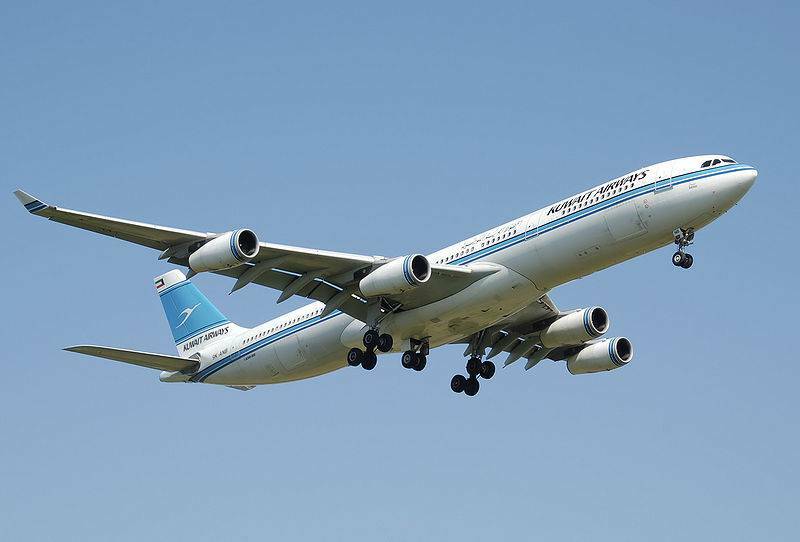 In January 2006, Airbus announced plans to develop the A340E (Enhanced). Airbus promoted that the A340E would be more fuel-efficient than earlier A340s and close the 8-9% disparity with the Boeing 777 by using Trent 1500 engines. 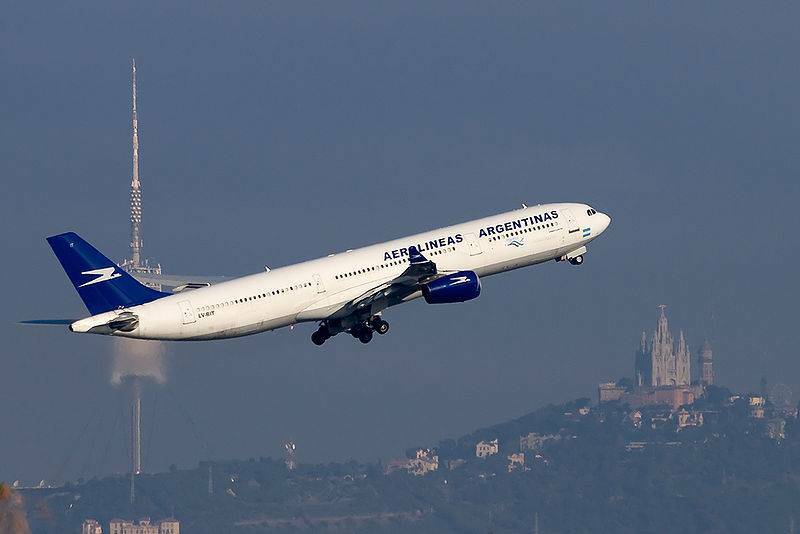 Airbus has predicted that it will probably produce 127 A340 units through 2016, after which production will cease. In mid-2008, with jet fuel prices double those of the year before, the A340's fuel consumption led airlines to curtail very long flights of greater than 15 hours. Thai Airways International cancelled its 17-hour, nonstop Bangkok-New York/JFK route on July 1, 2008, and has changed its Bangkok-Los Angeles route to one-stop service via Osaka/KIX, with a Boeing 777-300. All 4 of its A340-500 fleet are for sale. While short flights stress aircraft more than long flights, and result in more frequent fuel-thirsty take-offs and landings, ultra-long flights require an airline to fill an aircraft's fuel tanks to the maximum; this means that, en route, the plane is burning a lot of fuel just to carry fuel, a "flying tanker with a few people on board," Air France-KLM SA's chief executive Pierre-Henri Gourgeon told the Wall Street Journal. While Thai Airways has consistently filled 80% of the seats on its NYC-Bangkok flights, it estimates that, at 2008 fuel prices, it would need an impossible 120% of seats filled just to break even. Other airlines are re-examining long-haul flights. In August, 2008, Cathay Pacific told the Wall Street Journal that rising fuel prices are hurting its trans-Pacific long haul routes disproportionately; it will cut the number of such flights it offers and redeploy its aircraft to shorter routes such as between Hong Kong and Australia. "We will...reshaping our network where necessary to ensure we fly aircraft to where we can cover our costs and also make some money," Cathay Pacific CEO Tony Tyler told the newspaper. There are four variants of the A340. The A340-200 and A340-300 were launched in 1987 with introduction into service in March 1993. The A340-500 and A340-600 were launched in 1997 with introduction into service in 2002. All variants are available in a corporate version from Airbus Executive and Private Aviation. One of two initial versions of the A340, the A340-200, with 261 passengers in a three-class cabin layout has a range of 7,450 nautical miles (13,800 km). This is the shortest version of the type and the only version with wingspan measuring greater than the length of the plane. It is powered by four CFMI CFM56-5C4 engines. The plane was intended to open long and thin routes, especially over water. One version of this type was ordered by the Sultan of Brunei requesting a non-stop range of 8,000 nautical miles (14820 km). This A340-8000 had an increased fuel capacity, a MTOW of 275 tonnes similar to the A340-300, and minor reinforcements to the undercarriage. Upon completion its final range was specified at 8,100 nautical miles (15,000 km). It is powered by the 34,000 lbf (151 kN) thrust CFMI CFM56-5C4s similar to the -300E. Other A340-200s were later given performance improvement packages (PIPs) which helped them achieve similar gains in capability as to the A340-8000. Those aircraft are labeled A340-213X. The range for this version is 8,000 NM (14,820 km). Due to its large wingspan, four engines, low capacity, and improvements to the A340-300, the -200 proved heavy and unpopular with mainstream airlines. 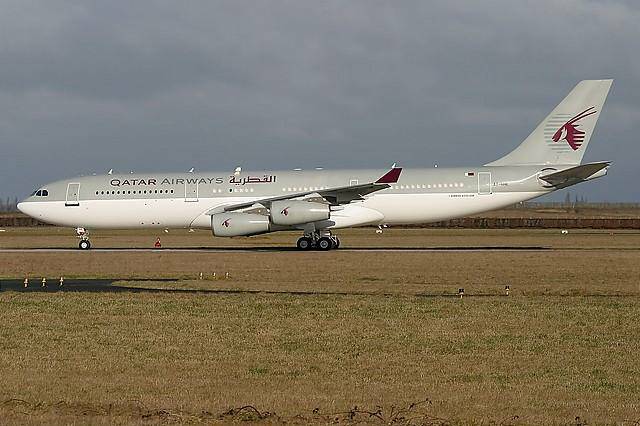 Only 28 A340-200s were produced with several now in VIP service. South African Airways is the largest operator with 6 flying mostly on Cape Town routes. Other current operators include Aerolineas Argentinas (4), Royal Jordanian (4), Egypt Air (3) and Conviasa (1). Some A340-200 are used for VIP or military use. Examples of these are Royal Brunei Airlines, Qatar Airways, Arab Republic of Egypt Government, Saudi Arabia Air Force, The Hashemite Kingdom of Jordan and the French Air Force. Other historical operators include Cathay Pacific, Philippine Airlines, and Air Bourbon, among others. This version is now out of production. The A340-300 flies 295 passengers in a typical three-class cabin layout over 6,700 nautical miles (12,400 km). This is the initial version, having flown on 25 October 1991, and entered service with Lufthansa and Air France in March 1993. It is powered by four CFMI CFM56-5C engines, similar to the -200. Its two closest competitors are the Boeing 777-200ER and, formerly, the McDonnell-Douglas MD-11, which is no longer in production. The A340-313E is a heavyweight version of the A340, and was first delivered to Singapore Airlines in April 1996, though Singapore Airlines no longer operates this model. The A340-313X is the latest version of this type and was first delivered to South African Airways in 2003. It has a maximum takeoff weight (MTOW) of 276.5 tonnes with typical range with 295 passengers of between 7,200 and 7,400 nautical miles (13,300 km and 13,700 km). It is powered by the more powerful 34,000 lbf (151 kN) thrust CFMI CFM56-5C4s. The largest operator of this type is Lufthansa with 30. Two of the present 30 Lufthansa 340-313 will enter into Luftwaffe Flugbereitschaft service, command aviation, as federal German government VIP shuttles in 2009. The A340-300 is no longer in production with the last of 217 -300s delivered to a private Russian customer in September 2008, with the final airline delivery to Finnair in July 2008. The A340-300 will be superseeded by the A350-900. The A340-500 was introduced as the world's longest-range commercial airliner. It made its first flight on 11 February 2002, and was certified on 3 December 2002 with early deliveries to Emirates Airline. While the KC-10 Extender is the longest-ranged production aircraft, the A340-500 was the world's longest-range commercial airliner until the introduction of the Boeing 777-200LR in February 2006. The A340-500 can fly 313 passengers in a three-class cabin layout over 8,650 nautical miles (16,020 km), e.g. it is capable of traveling non-stop from London to Perth, Australia, though a return flight requires a fuel stop due to headwinds. Singapore Airlines, for example, initially used this model in a two-class, 181-passenger layout for its Newark-Singapore nonstop route: a 17-hour, 45-minute "westbound" (really northbound to 70 nmi (130 km) abeam the North Pole; then south from there across Russia, Mongolia and China), 18-hour, 30-minute eastbound, 15,345 km (8,285 NM) journey that remains the longest scheduled non-stop commercial flight in the world. By late June, 2008, Singapore Airlines completed conversion of its 5 A340-500's to an all-Business Class configuration, with 100 seats, due to high-end passenger demand. These aircraft are also used on the SQ Los Angeles-Singapore nonstop route. Thai Airways International flew this model on non-stop flights from Bangkok to Los Angeles and New York/JFK, but terminated the New York service on July 1, 2008 due to increased fuel costs. 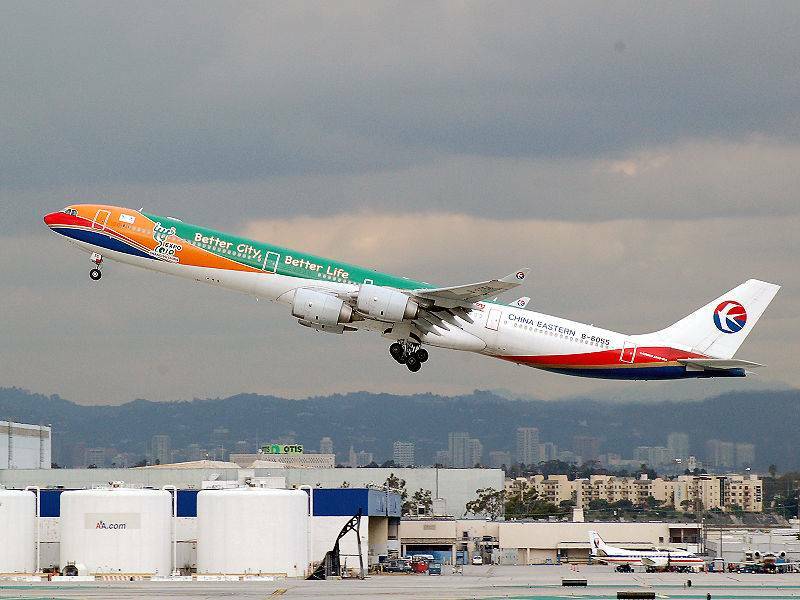 Thai's Los Angeles-Bangkok route is still in service. 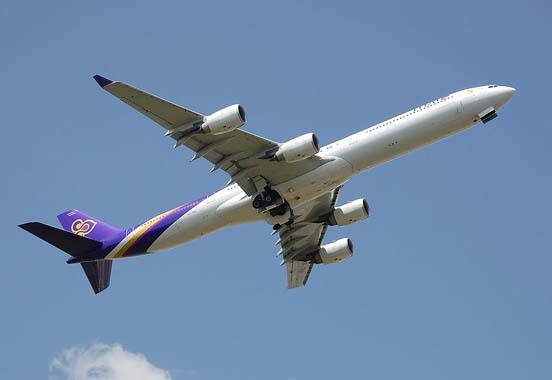 Thai's entire fleet of four A340-500s was put up for sale, but poor resale value caused Thai to withdraw them from the market in October, 2008. Thai is now using some of these aircraft on thinner European routes, such as Bangkok-Oslo, but will sell them all as soon as it can obtain a reasonable price. They are worth about USD 180 million each. . Etihad Airways is a recent new customer. In the first transfer of A340-500s from one airline to another, TAM Brazilian Airlines has acquired two Air Canada airplanes for use on its São Paulo-Frankfurt route, after Air Canada replaced them with Boeing 777LRs on its Toronto-Hong Kong route. Additionally, Nigeria's Arik Air has acquired three A340-500s following relinquishment of their delivery positions by Kingfisher Airlines of India. A total of 35 A340-500s have been ordered by seven airlines and four Government "VIP" operators (including Qatar and Algeria), with 29 delivered as of April, 2009. Compared with the A340-300, the -500 features a 4.3 m fuselage stretch, an enlarged wing area, massive increase in fuel capacity (around 50% over -300), slightly higher cruising speed, larger horizontal stabilizer and smaller vertical tailplane. The A340-500/-600 has taxi cameras to help the pilots during ground maneuvers. The A340-500 is powered by four 53,000 lbf (236 kN) thrust Rolls-Royce Trent 553 turbofans. The A340-500HGW (High Gross Weight) version has a range of 9,000 NM (16,700 km) and an MTOW of 380 tonnes and first flew on the 13th October 2006. It uses the strengthened structure and enlarged fuel capacity of the A340-600HGW. The certification aircraft became the first delivery, to Thai Airways International, on 11 April 2007. Kingfisher Airlines had planned to use this model to operate Non-stop flights from India to North America. However, in October 2008, Kingfisher transferred three of its five delivery positions to Arik Air of Nigeria, due to the worldwide recession. Arik Air received these three A340-500s in November, 2008, and placed them in service on its new Lagos-London Heathrow route, with nonstop routes to New York, Atlanta, Miami and Houston being added.The A340-500HGW is powered by four 56,000 lbf (249 kN) thrust Rolls-Royce Trent 556 turbofans. Emirates Airline is the largest operator, with ten aircraft. The direct Boeing equivalent is the 777-200LR, which entered service in February 2006, exceeding the A340-500 as the world's longest-range commercial airliner. Planform view of a Virgin Atlantic A340-600 take off. The undercarriages are still retracting. Designed as an early generation 747 replacement, the A340-600 flies 380 passengers in a three-class cabin layout (419 in 2 class) over 7,500 nautical miles (13,900 km). It provides similar passenger capacity to a 747 but with 25% more cargo volume, and at lower trip and seat costs. First flight of the A340-600 was made on 23 April 2001. Virgin Atlantic began commercial services in August 2002. The A340-600 is more than 10 m longer than a basic -300, making it the longest airliner currently in production; more than four metres longer than the Boeing 747-400. The Airbus A340-600 will continue to hold the record for being the worlds longest commercial aircraft until the first Boeing 747-8 Intercontinental is rolled out in 2010. It is powered by four 56,000 lbf (249 kN) thrust Rolls-Royce Trent 556 turbofans. It also has an additional four-wheel undercarriage on the fuselage center-line to cope with the increased MTOW. Airbus has made provisions for freeing additional upper deck main cabin space, by providing optional arrangements for additional facilities such as crew rest areas, galleys, and lavatories upon the "stretched" A340 aircraft's lower decks. In April 2007, The Times reported that Airbus had advised carriers to reduce cargo in the forward section by five tonnes to compensate for overweight first and business class sections. The additional weight causes the aircraft's center of gravity to move forward thus reducing cruise efficiency. Airlines affected by the advisory are considering demanding compensation from Airbus. 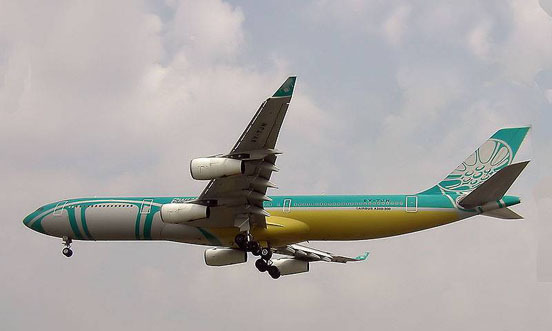 The A340-600HGW (High Gross Weight) version first flew on 18 November 2005 and was certified on 14 April 2006. It has an MTOW of 380 tonnes and a range of up to 7,900 NM (14,600 km), made possible by strengthened structure, increased fuel, more powerful engines and new manufacturing techniques like laser beam welding. The A340-600HGW is powered by four 60,000 lbf (267 kN) thrust Rolls-Royce Trent 560 turbofans. Emirates Airline became the launch customer for the -600HGW when it ordered 18 at the 2003 Paris Air Show; but postponed their order indefinitely and later cancelled. Rival Qatar Airways, which placed its order at the same airshow, took delivery of the first aircraft on 11 September 2006. It has since let its purchase options expire. The most direct Boeing equivalent to the A340-600 is the 777-300ER (although the 777-300 can also be offered in competition). The A340-600 will eventually in the future be replaced by the A350-1000, which will also compete with the 777-300ER. 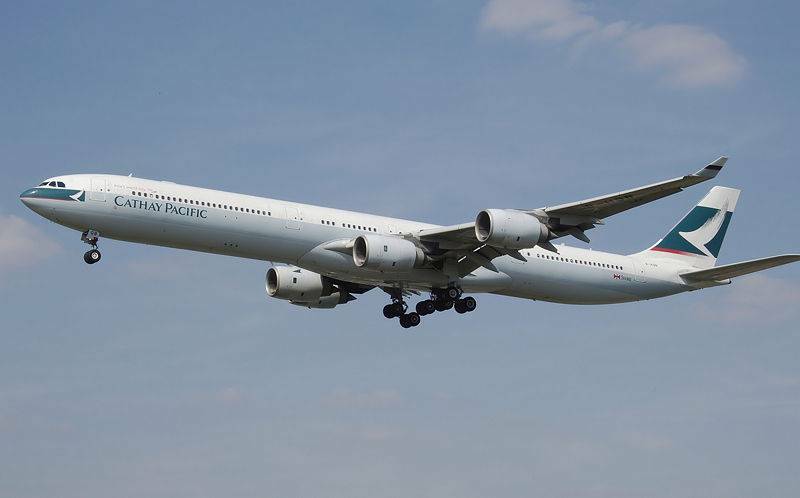 By the end of May 2009 a total of 385 A340s had been ordered (28 A340-200, 218 A340-300, 35 A340-500 and 104 A340-600) and 365 delivered (28 A340-200, 218 A340-300, 29 A340-500 and 90 A340-600). 20 January 1994 - Air France, an A340-211 (F-GNIA) was lost to fire during servicing at Charles de Gaulle Airport. 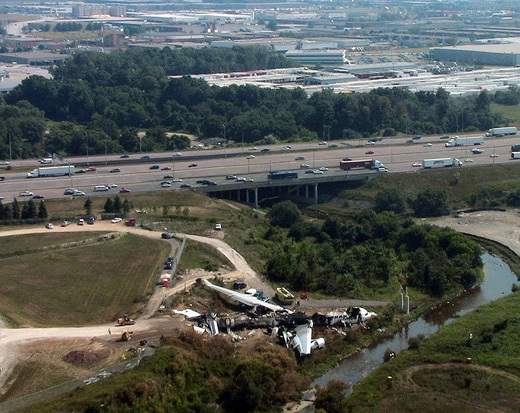 2 August 2005 - Air France Flight 358, all 297 passengers and 12 crew survived a crash and fire after their A340-300 (F-GLZQ) overshot runway 24L at Toronto Pearson International Airport during a landing in a thunderstorm. The aircraft slid into Etobicoke Creek and broke-up. Forty-three were injured, one seriously; some passengers jumped nearly 20 ft (6 m) to the ground. 9 November 2007 - An Iberia Airlines A340-600 (EC-JOH) was badly damaged after sliding off the runway at Ecuador’s Mariscal Sucre International Airport. The landing gear collapsed and two engines broke off. All 333 passengers and crew were evacuated via inflatable slides, and there were no serious injuries. The aircraft was scrapped. 15 November 2007 - An A340-600 was damaged beyond repair during ground engine testing at Airbus' facilities at Toulouse Blagnac International Airport. 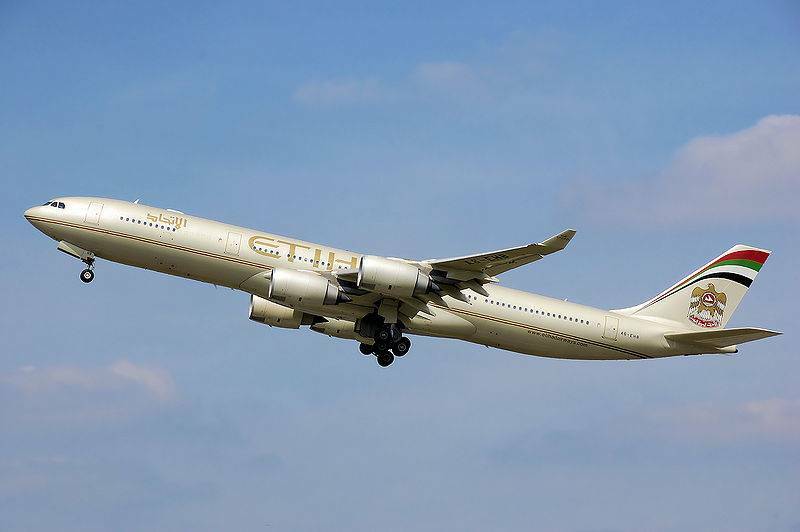 Six days prior to the airplane's planned delivery to Etihad Airways, the plane pushed itself up a sloped concrete wall, suffering severe fuselage damage. The cockpit section was severed and fell to the ground from a height of about 15 m atop the wall. Five people on board were injured, three of them seriously. The aircraft was written off. 20 March 2009 - An A340-500 being used for Emirates Airline Flight 407 struck its tail multiple times during the takeoff roll from Melbourne Airport, resulting in severe damage to the rear pressure bulkhead. The aircraft returned safely to the airport after dumping fuel and no serious injuries were reported among the 225 passengers.